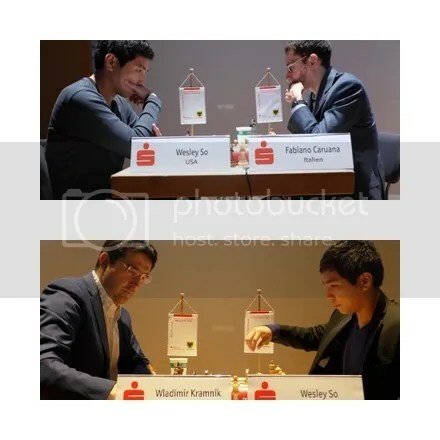 The event is an 8-player single round-robin super tournament with the participation of Fabiano Caruana, Vladimir Kramnik, Wesley So, Arkadij Naiditsch, Ian Nepomniachtchi, Hou Yifan, Liviu-Dieter Nisipeanu, and Georg Meier. The super-tournament had an average rating of 2724, a category 19 (2701-2725). The Top 3 seed players (Caruana, Kramnik & So) are in the Top-10 players in the World. The 4th & 5th seed ( Naiditsch & Nepomniachtchi) are rated at 2700+, Hou, Yifan is the Women’s highest rated player and a former Women’s World Champion. Nisipeanu & Meier are the host country-Germany other top two rated player next to Naiditsch. GM Fabiano Caruana, who now represents U.S. Chess Federation (USCF) since 25 June 2015, had a slow start with 0.5/2 but had an impressive run winning five games in a row to win the Sparkassen Chess Meeting for the 3rd time (2012. 2014 & 2015). In the last round(R7) he completed his fantastic streak of five wins, to win the tourney, defeating GM Liviu-Dieter Nisipeanu in the Evans gambit resurrected by Nisipeanu (against the Ruy Lopez) in his own quest for the title, to score 5.5/7 points (+5=1-1) a 1.5 points ahead of his nearest rivals So and Nisipeanu who tied at 4.0/7. 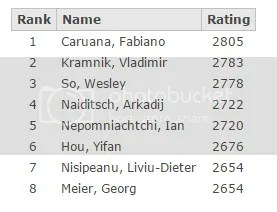 Caruana’s triumph at Dortmund, placed him back @ the elite level above 2800 and Top 5 in the World’s Live Rating standings. His amazing TPR of 2942 and a +11.3 in rating points place him back on track to his elusive quest of becoming a World Champion. 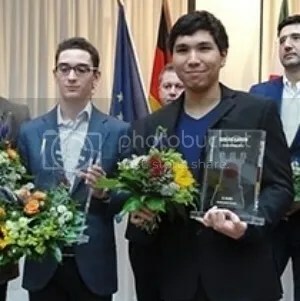 Philippines born GM Wesley So now also representing USCF a first timer in this strong Category 19 Sparkassen Chess Meeting, scored 4.0/7 points(+3=2-2) and tied for 2nd place with Germany’s #2 top rated GM Liviu-Dieter Nisipeanu(2654) but after tiebreak the second U.S. player in Dortmund took 2nd place honors because of the 1st tie-break criteria – higher number of games played with Black pieces. Wesley So played 4-games with black VS Nisipeanu 3-games. It was a bizarre tourney for Wesley. After two losses (R1 & R3) in his first three games it seemed he was having an awful event, but in the final analysis he beat his two top rivals #1 seed Caruana(R2) and #2 seed Kramnik(R7) to compensate his 2-losses [Nisipeanu(R1) & Naiditsch(R3)] and even managed to catch up and grab 2nd place, a one-two finish for the USCF. The #3 seed Wesley So Tournament Performance Rating (TPR) was 2766. 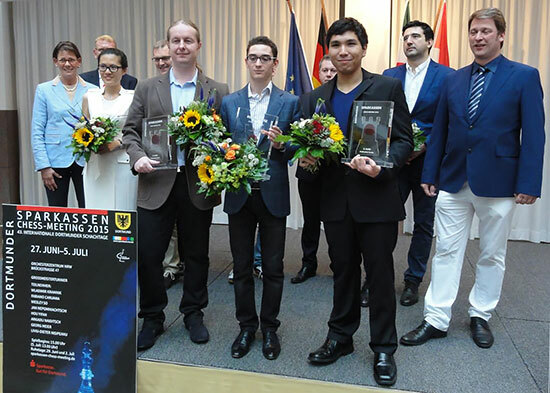 Though he loss -0.9 in rating points his final game(R7) win VS Mr ‘Dortmund’ Kramnik, a 10-time winner in Dortmund, the 14th World Champion, against Kramnik’s Berlin pet defense was enough to propel him back to 7th place and relegating Kramnik to 8th place in the World Chess Live Rating List.